Alyssa's Story - TEENS OF HONOR, INC.
Alyssa Russell is a fourteen year old entrepreneur, business owner, and youth life coach. In May 2014, Alyssa will be graduating from high school at age fifteen. After graduating, she is looking forward to continuing her education at one of the nation’s top university (Harvard, Yale, University of Pennsylvania) just to name a few. Her focus and desire to be great has given her the ability to choose her own path. One of the many option is to continue her entrepreneurial pursuits. 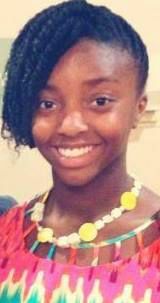 Alyssa plans to continue with her jewelry business which she has made a splash in a big way at this tender age of 14. Alyssa made her fashion debut at New York Fashion Week in September 2013 with her stunning jewelry. At Fashion Week, Alyssa designed jewelry for designer Haneefah M.’s Spring/Summer 2014 clothing line. Immediately following the event, Alyssa was interviewed LIVE on 98.1 FM. Alyssa will be concentrating her efforts into her jewelry business where she will further her passion of creating unique, personalized, masterpieces through every piece of jewelry designed to accentuate women beauty. She believes her line will become well known and popular internationally because jewelry is a value add, and not the value of the woman wearing it. Alyssa’s jewelry can be viewed at www.jba.weebly.com. Here you will find how truly talented this future power player is. Alyssa is not only a young black power in the fashion world but she is also a motivational speaker and teen life coach which is part of her business enterprise. She has made an appearance on the Dani Johnson television and radio show which was broadcasted in over twenty-two million homes. Alyssa was also featured as a guest speaker on a training/coaching call held by Dani Johnson—an internationally known multi-millionaire, business, finance, and relationship coach and expert. Alyssa believes she can change the world for the better by pursuing her other passion of coaching young people to be and become leaders in every aspect of their life. She aims to teach and train young people how to use their innate gifts, skills, and abilities to become entrepreneurs and be successful in life. Additionally, she believes that each individual has the potential to produce an ‘orchard of blessings’—in relationships, personal/family life, business, and finances, etcetera. Overall, Alyssa is a dynamic young black lady that desires to change the world and make it a better place with the things she offers to the world. This young black girl rocks! !